← The Intelligence and Security Committee: a committee in decline? At a meeting at Windsor Castle at the end of April the Labour MP, Kevan Jones, was appointed as a member of the Privy Council. Mr Jones can now adopt the title, Right Honourable, and unless he chooses to resign, which is very rare, it is a position he will hold for life. Membership of the Privy Council is, by convention, offered to Cabinet Ministers, opposition leaders and other notable public figures including Archbishops and senior judges. Mr Jones, who has been an MP since 2001, has never held a Cabinet post, his most senior Ministerial role being as a junior defence Minister from 2008 to 2010. He owes his elevation to the Privy Council to his recent appointment to the parliamentary Intelligence and Security Committee (ISC). Mr Jones is the final member of the current ISC to elevated to the Privy Council. His appointment reinforces a common misperception that ISC members must also be members of the Privy Council. I have lost count of the number of occasions on which I have been told by Members of Parliament and others that the ISC is a very senior committee and only Privy Counsellors may serve on it. The assumption is either that only Privy Counsellors are appointed to the ISC or that appointment to the ISC is automatically followed by elevation to the Privy Council. In fact, neither of these things are true. ISC members do not need to be Privy Counsellors, nor does membership of the ISC automatically lead to elevation to the Privy Council. There has been a tendency towards seniority in appointments to the ISC with the result that a large proportion of appointees have previously held Ministerial positions which have meant that they were already members of the Privy Council before appointment to the committee. However, the proportion of ISC members who are Privy Counsellors has fluctuated throughout the committee’s history. For example, the first committee, which was appointed in 1994, comprised five Privy Counsellors, including the Chair, Tom King, and four members who were not Privy Counsellors. It was not until 2004, that, for the first time, all members of the ISC were also Privy Counsellors, but this changed again with the appointment of new members following the 2005 general election. Nor has appointment to the ISC guaranteed Privy Council membership. Several ISC members, including Allan Rogers, Ben Chapman and Dari Taylor have never been members of the Privy Council. Others including Yvette Cooper and Rosie Winterton, who are now Privy Counsellors received this honour as a result of ministerial appointments after leaving the ISC. Others have served for long periods on the ISC before being appointed to the Privy Council. Michael Mates, for example, one of the four members of the first committee who were not Privy Counsellors, served on the ISC for ten years before being appointed to the Privy Council. Moreover, rather than being a reward for ISC service, Mates’ invitation to join the Privy Council appears to have been to allow him to serve on the committee of Privy Counsellors which conducted an inquiry into Iraqi weapons of mass destruction. 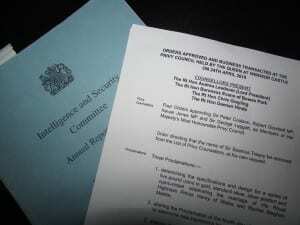 Others such as Julian Lewis and Mark Field, were made Privy Counsellors on leaving the ISC, rather than on appointment. The mistaken assumption that ISC members must also be members of the Privy Council appears to be based on the long-established practice of governments sharing material with selected MPs on ‘Privy Council terms’. Members of the Privy Council must swear an oath of loyalty to the monarch, which includes a promise to ‘keep secret all matters committed and revealed in Council.’ This has been a useful device to enable governments to share sensitive material, including intelligence material, with individuals who are not members of the government. Using this mechanism, Leaders of the Opposition have occasionally been apprised of concerns if one of their MPs is considered to be a security risk. It has also been used to share sensitive information with senior opposition politicians at times of national emergency or crisis such as the Cuban missile crisis, the war in Iraq or more recently in relation to the military intervention in Syria. However, while the Privy Council oath has been a convenient mechanism for the occasional sharing of sensitive information beyond government, it clearly was not considered sufficient protection for the extent of access to intelligence material provided by membership of the ISC. ISC members, like Government Ministers, are bound by something more robust and legally binding than the Privy Council oath; all are notified under the Official Secrets Act. Membership of the Privy Council is for most a welcome reward for service on the Intelligence and Security Committee, but it is the legal obligations backed up by the threat of prosecution which is the real guarantor of secrecy from the ISC. This entry was posted in Uncategorized and tagged Intelligence and Security Committee, ISC Appointments, Privy Council. Bookmark the permalink.